Greeks vowed in front of the Bible that they will loyally translate from Macedonian - republic-of-macedonias jimdo page! 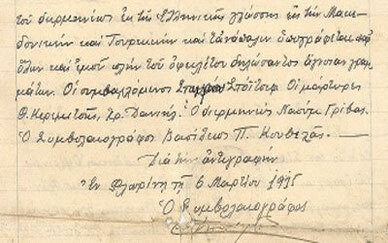 In the notary act is written: “In front of me, the notary public Vasiliu P. Kuvela, and present witnesses, Greek citizens I know, healthy and never convicted citizens of Lerin, the traders Teodor Keramici and Hristo Danail, came and legitimated Stavro Stojchev, farmer of Opsirina, district Florina and Alim Juzeir, citizen of Florina, farmer. They are not familiar with the Greek language. The first one speaks Macedonian, and the second speaks Turkish. We called the translator Naum Griva, tobacco trader, who vowed in front of the Holy Gospel that he will translate from Macedonian to Turkish and from Turkish to Macedonian loyally”. Further in the text is written for the loan that Stojchev gave to Juzeir of 4530 drachma at that time, i.e. 220 ottoman liras. 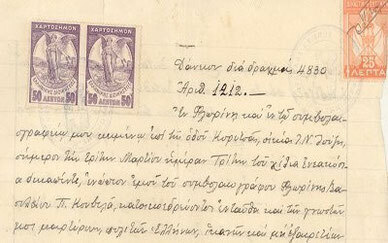 The document is signed by all present and it is legalized by stamps of the notary public and the Greek administration.